Discussion in 'iOS Blog Discussion' started by MacRumors, Jul 19, 2011. While, due to the aforementioned restrictions, the iControlPad can only interface with un-jailbroken iOS devices by way of keyboard emulation, it can interface with other platforms, including Android and WebOS, via the more robust protocols and, thus, deliver its full range of capabilities. Keyboard emulation does allow all other controls on the device to work under iOS -- but no analog sticks, which need to send a constant stream of positional data to the host device. It's too big and bulky it. I hope that on the iPhone 4 version its slimmer and slides out from the bottom. Once the cost comes down a bit and the shipping is reasonable I'll buy one. Rumor is ThinkGeek.com was thinking re-selling it. That would be great. 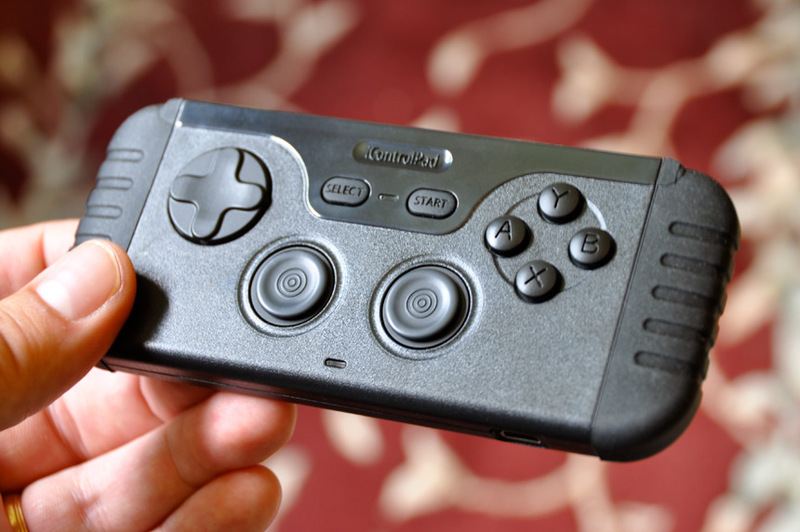 I've always loved the idea of a gamepad for the iPhone, even as far back as wishing for one for the iPod Video (so Sonic the Hedgehog could be played decently). I hope developers come out to support this accessory, because there's a lot of potential with this! Wipeout and Ridge Racer on the go? On my iPhone? Damn it - I'm sold. If anything, I think it's too flimsy. I prefer my controllers a bit more substantial and rugged. A puny, poorly constructed controllers wouldn't last a gaming session with me. I’d actually like one of these (maybe in a better color scheme?) even though I’d mainly use it at home, just for certain longer game sessions. 50% of what I want it for is to have something bigger to grip! Easier on the hands. 30% of what I want it for is the physical buttons. I do fine without, but they’d be a nice option too. The other 20% of what I want is those analog sticks! I hope (and believe) that they’ll be working someday in future. For every story people froth about with Apple “banning” something (the universal term for anything that doesn’t happen today), two stories slip quietly by about Apple being very flexible and changing to meet what people want (like the iPad orientation switch, Boot Camp, and magazine subscription rules). Apple has improved BT support before, and I suspect they will again. Forget the control pad... I just want Wipeout as an app on my iPhone! Shakespeare invented words, why can't Apple? Everyone can understand what "funnest" means. Although you might think it sounds weird. Maybe I'm naive, but it seems a product like this could propel IOS devices to new heights in the portable gaming platform market. If it works I don't care really what it looks like. It looks like a simple gamepad to me. I'm more concerned about Apple updating their Bluetooth drivers/software on the iOS devices so accessories like this can work properly without jailbreaking! That is awesome! I'll take one of those! They tried that, and from what I believe Apple wouldn't approve it as an official accessory or something. (If I recall correctly). Also Bluetooth helps it be more compatible with all devices. If the bluetooth is giving them problems, why not use the dock connector? Also Bluetooth helps it be more compatible with all devices. Except, you know, the iPhone, where the joysticks don't work. The Flick or Fling or whatever it's called has it right... it turns the virtual joysticks on screen into real joysticks, without requiring developers to do anything. For one of these controllers to take off, they need to get developers to make their games compatible with them... and I'm a developer and I'm hardly even considering it... are there shoulder buttons on it? If there are, I'll consider it, if not, no way. The problem with the suction cup contolers is they still block out part of the screen. Some games it's not that big of a deal, others it is. They also don't address buttons. I think the maker of these is hoping the big developers, EA for example, will take advantage of these. Playing Madden on this will be much closer to the console experience a lot of gamers enjoy. You may not see shoulder buttons on this for a while since the makers of mobile (not just iOS) games don't make games with that many buttons. If shoulder buttons are required to play the game the developer will limit themselves by designing their games just for people with control pads. I would buy one of these if/when the price comes down. $55 seems like a high price for a device with limited support. I'd order one today if it were $29.99 or less. A bummer that I see is that it is bluetooth so you won't be seeing these on planes any time soon. Yes but this is something that can thankfully be fixed. Worse case you have to Jailbreak, but it's Apple we have to turn to for Bluetooth support, as they need to update their Bluetooth software/drivers for the iPhone to allow this type of interaction with a device. Last time I checked the original GameBoy didn't have four action buttons, dual analog sticks and Bluetooth. I don't think the design is that bad for a 3rd party accessory. It sure beats a bluetooth chip shoved into an NES controller! I wonder what the battery life will be.